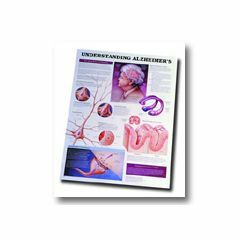 Understanding Alzheimer's Chart is a reference guide to help client, family, caregivers, and professionals learn about the brain and the devastating effects of Alzheimer's disease. Medical terminology and illustrations define the areas of the brain affected, the changes that take place and other important pathological conditions. No need for a separate manual for reference, since everything is printed on this laminated poster. Authentic colors on high-quality paper. Metal eyelets for convenient wall hanging, or set on stand. 20" x 26" markable chart with write-on / wipe-off pens.